Three Hypermastigotes (Trichonympha sp.) and a Trichomonas sp. (top left) in the midst of a living soup of other small protists and partly decayed wood. If you remove the gut from a termite and puncture it you will find the gut is crammed with the weirdest looking protists. The largest are Hypermastigotes. They have many long flagella. The image above shows how crowded the termite gut is. Protists in many shapes and sizes swim frantically in what looks like a living soup. 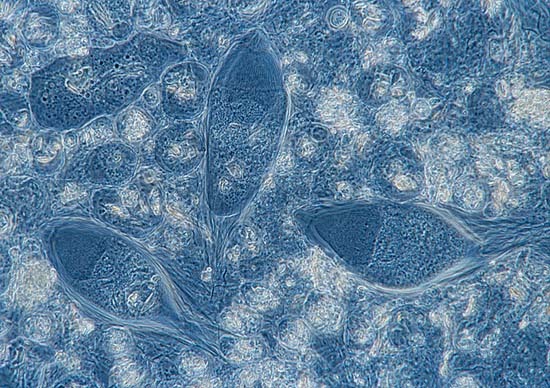 The righthand image shows how the individual protists can be separated a bit by adding a little drop of (slightly saline) water. These protists help the termite to digest wood. The actual digestion of the wood is done by bacteria living inside the protists. The phase contrast images were made with a 40X objective. 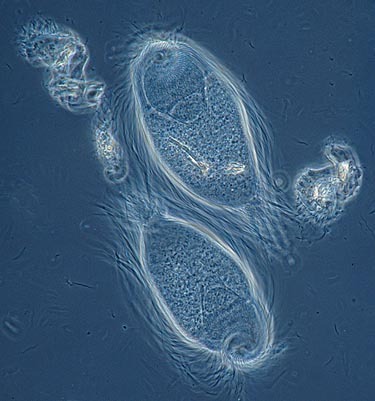 The protists are less than a tenth of a millimeter. Find out more about them in the beautifully illustrated Micscape article by Richard Howey.